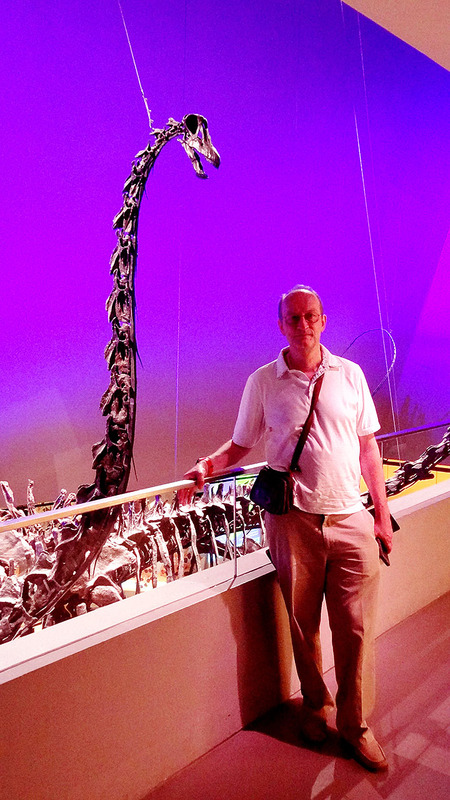 Last week, the museum hosted Prof Peter Lucas from Kuwait University as part of the LKCNHM Visiting Fellowship Scheme. During his visit, Prof Lucas was hosted by Assoc Prof Hugh Tan, and his colleagues and their students from the Department of Biological Sciences and Yale-NUS College. One aspect of their collaborative study was on the fracture toughness of leaves, which has a direct bearing on herbivory and leaf age. Prof Lucas is one of the world’s foremost authorities in this area. During his stay here, they explored measures for mechanical and structural leaf traits to allow meaningful comparison across different plant and leaf types. Their findings could tell us why some herbivores leave certain leaves alone! Prof Lucas also visited the museum’s gallery and checked out one of our crowd favourites, which happens to be a massive herbivore too!